The T-tail was reportedly used to prevent the Skylark from being affected by power changes in the way a standard tail configuration is. Designer Marsden said, "This configuration puts the horizontal stabilizer in the optimum position for clean airflow. In the minus or reflex position, the flaps move upward from neutral to flatten the top of the wing and add curvature to the lower wing surface. This sailplane-style design feature adds a few knots of speed to the airplane. The Skylark's four-position flaps deploy from minus 10 degrees to plus 10, 20, and 40 degrees. The canopy slides forward on a robust rail, and operated smoothly on the aircraft flown for this report. More canopy latches, including a locking latch, will be added to future Skylarks. The 43 inch-wide cockpit is available with conventional gauges, glass avionics, or a combination. The baggage area will hold up to 45 pounds, depending on the useful load remaining after adding pilot, passenger, and fuel. A T-tail and winglets set the Dova Skylark apart from most S-LSA; it's the only ready-to-fly LSA sporting both such features. The swept winglets are intended to convert wingtip vortices into lift, a concept proven on faster aircraft. 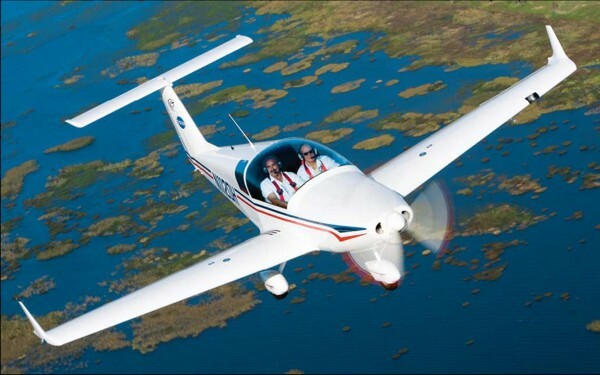 A Doubly International LSA SportsPlanes.com imports several light-sport aircraft (LSA) that have found ready buyers. After researching through several designs, SportsPlanes' owner Josh Foss originally settled on the Comco Ikarus C42 and Breezer and the U.S.-built American Flyer for its fleet. Most recently, the company added the Czech-built Dova Skylark to its offerings. However, the real story of this company is not Josh Foss' care in the selection of what airplanes to sell. What may be more important to the marketplace is the network his company has built to bring service and support to SportsPlanes.com's customers. Currently, 15 SportsPlanes centers are operating, with the goal to establish 25 centers nationwide. Investigating the Skylark My opportunity to fly the Skylark came while attending the U.S. 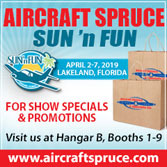 Sport Aviation Expo in Sebring, Florida, in January. I flew with Darrell Hamilton, the SportsPlanes representative for Florida. Darrell retired from Northwest Airlines four years ago. He most recently crewed the fly-by-wire Airbus A320, which needs only small control movements. But he also piloted the Boeing 747 and, before that, the McDonnell-Douglas DC-9. The latter, he said, took lots of control pressure and control column movement. He had to unlearn that experience when he started flying the more responsive Dova Skylark. My regular evaluation routine put us through some paces Darrell had never explored in his Skylark, but SportsPlanes.com company pilots Dale Faux and Eric Dellenbach, who is also SportsPlanes. com's national sales director, have wrung the plane out extensively. Although the Skylark is a Czechbuilt LSA, it was designed by David Marsden, a professor of aeronautical engineering at the University of Alberta in Edmonton, Canada. Marsden was able to use the university's wind tunnel, a capability not available to many LSA designers. After completing the design work, Marsden enlisted Dova to be the manufacturer. Later, in 2005, he sold the design rights to the Eastern European company. However, Marsden remains involved to help with some of the problem solving that's inevitable with initial production of a new design. The Skylark is an all-metal airplane, primarily using 2024-T6 aluminum as its construction material. Marsden describes the airfoil as a semi-natural laminar flow design. That may not mean much to some pilots, but the goal was to keep the air attached to the wing through as much chord length as possible. The Skylark's swept winglets are intended to convert wingtip vortices into lift, a concept proven on faster aircraft. Even if the gain is modest on the Skylark, it certainly lends a modern look to the LSA, while setting the design apart from the others. Since perception is paramount, this design feature simply may be good marketing. A T-tail is also rather rare among LSA, and it was reportedly conceived to prevent the Skylark from being affected by power changes in the way a more common cruciform tail may be. I can't judge that idea, but I did note that the T-tail is high enough to stay effective even when doing a full-stall landing. Some T-tailed aircraft experience flow disturbance when in a nose-high attitude, but I found none of this in Skylark. Front Cabin The Skylark has a well-braced step aft of the wing to facilitate clambering up onto the low wing. To further assist entry, a sturdy rail runs laterally aft of the seats, and I also found the aft canopy support to be quite solid. The canopy itself shouldn't be used for support as it will move toward you if you pull on it, traversing readily in its tracks. The canopy in Darrell's Skylark latched only at the upper rear. A new canopy configuration is planned with latches on each side and a locking latch on the top aft to give owners a keyed entry. The present canopy arrangement with a latch only at the rear is not only less secure feeling but also provides a clothing catch point during entry/exit, according to Darrell. Helping secure the canopy is a robust track on each side. I noted the canopy produces a whistling noise at cruising speeds. At climb attitude the sound resembles a troubling engine noise, but Darrell assured me it was the canopy and not the engine. But that would certainly unnerve a new pilot attuned to every unusual sound. Perhaps the new canopy setup will silence this noise; if not, in time owners will adapt. The Skylark's 43-inch-wide cabin mimics the interior of a Cessna 172, but it is a few inches narrower than some LSA available. I found Skylark's interior adequately roomy for two average- sized persons. Two or 3 inches separated Darrell and me, and I was barely touching the outside of the cabin. Foot room is spacious whereas some designs are cramped. A few LSA leave no alternative but to put your feet on the rudder pedals or awkwardly aft of them on the floor in front of your seat. The Skylark's center console takes little away from the floor space. Generally, the cabin interior is covered with a pleasing cloth finish (not carpeting) that dampens noise somewhat. The Skylark's seats have a lot of forward support on the bottom cushion, providing a surface all the way to your knees. For many pilots this assures a comfortable seating position for longer flights. The spar runs under your knees rather than under your bottom, which itself may translate to greater safety in the event of a hard landing. Darrell indicated the Skylark seat structure will go through some redesign, too. Currently the seat pans are thin, and I can imagine some big fellows leaning on them too hard during entry. Also, Eric is suggesting seat and interior design changes that will add more padding. Though the seats in Darrell's Skylark had thin padding, I survived with no sore spots, thanks to the shape of the seats and the extended seat cushion. From the right seat, both trim control and throttle take a long reach, though they are convenient to the normal pilot-in-command left seat. In either seat, the joystick position is excellent. I could rest my right hand on my knee and operate the stick with small motions. I observed Darrell using his right knee (in the left seat) to support his throttle hand. Without an armrest, the vernier throttle proved a bit more challenging to adjust smoothly. As is common on many Rotax installations, there's no carb heat knob on the panel, but a choke control and a pull-for-heat/push-for-air knob flank the throttle. Darrell's Skylark was equipped with a TruTrak attitude indicator, altimeter, vertical speed indicator (VSI), airspeed indictor (ASI), and compass. Complementing those gauges, I had access to a comm radio, transponder, and a GPS in the popular AirGizmo dock. Engine instruments were conventionally placed on the right, including tachometer, single cylinder head temperature, oil pressure, oil temp, and dual fuel gauges. To the right of all these was a Hobbs hour meter and the emergency locator transmitter (ELT) controls. A 12-volt connector is available for other accessories|within the Rotax 912S's ability to offer electrical power. The Skylark has a spacious baggage area, but it is limited to 45 pounds. That capacity may be sufficient for most flights, but it would be easy to overload the area. Another change coming to Skylark is to move the seats about an inch, which will offset the possibility that occupants will overfill the baggage area resulting in an aft CG load. However, if you wanted to carry something large but light-sleeping bags come to mind-the space can accommodate such gear. The Skylark has an excellent useful load unless you load up on weighty equipment. With base price equipment, the Skylark weighs only 653 pounds. Given a relatively modest 45 pounds of baggage, weight and balance calculations appear to allow two 239-pound occupants, though folks that size might be snug in the 43-inch-wide cockpit. Most pilots will likely fly at somewhat less than full gross weight. Getting Reflexed With its flap arrangement, Skylark joins a limited number of LSA that offer a reflex position. The four-position flap lever deploys from minus 10 degrees to plus 10, 20, and 40 degrees. When you select the reflex or "minus" position, the flaps move upward from neutral to flatten the top of the wing and add curvature (though not undercamber) to the lower side. This sailplane-style design feature adds a few knots of speed to the airplane. In theory at least, it should reduce in-flight bumps by making the wing more symmetrical. In a departure from many LSA that have fuel selector levers that are off or on, Skylark's fuel selector sets for left, right, and closed, but not both. While I appreciate that this allows you to burn one wing tank to help level the plane, I'd prefer that a both position be available. Darrell's Skylark was fitted with a Garmin 396 and the standard six-pack of flight instruments. SportsPlanes. com will have other panel configurations prepared later this spring so you can choose a variety of steam gauges or glass avionics. Though it worked fine, I found the trim control rather counterintuitive. It is clearly labeled, but you must push the rocker switch toward the up position to lower the nose and toward the down position to raise it. The brakes in Darrell's Skylark were a bit weak. They have been a focus of some maintenance work, which explains why brake pedals were only installed on the left side of our test Skylark. Matco brakes are coming, and the standard Skylark configuration specifies toe brakes on both sides. Many LSA use a single hand-operated brake, which most general aviation (GA) pilots find a bit strange. Let's Go Cruising! Takeoff behind the 100-hp Rotax 912S proved rapid as is common on LSA flying with this engine. For landings, Darrell suggested setting power at 3000 rpm on long downwind with a pattern speed of 80-90 knots, which he considered a bit on the slow side. As he turned base and final, he held his speed at 70 knots. Darrell advised 20 degrees of flaps for standard operations, and my first landings went well at this setting. I also tried the full 40-degree setting as full flaps on some long-gliding LSA have presented challenges to GA pilots. In the Skylark, 40 degrees proved manageable, but of course, the briefer flare window required a bit more precision. I also experimented with forward and sideslips on some higher approaches and found these methods work well to control flight path. I found the Skylark's stick to be quite light in both roll and pitch- light enough that bumpy air will require some concentration. Darrell flew with two GA who also reported thinking the stick forces were on the light side. This is a common feeling about LSA in my experience, but once you become accustomed to a light control feel, you tend to prefer it. But a light touch is something to be learned. The day Darrell and I flew, a smog layer hung at about 3,000 feet. Below that in distinctly bumpier conditions the Skylark took more effort to fly. In the smooth air above, the plane flew effortlessly. This suggests excellent cross-country flying, at least in smoother air. Even in the lumpy air below 3,000 feet, the Skylark executed steep turns beautifully, showing sustained banks at sharp angles without adding any extra power. I found it easy to maintain the turn. By contrast, many older GA planes require at least a 100-rpm boost from cruise to hold a 45-degree bank through two complete highbank circles. In full-power, top-speed runs upand downwind, the tachometer reported approximately 5200 rpm. This max setting produced 100 knots into the wind and slightly more than 120 knots with the wind, averaging a shade greater than 110 knots (or close to 130 mph) at maximum continuous power. This check was done at about 4,000 feet MSL on a day slightly cooler than standard 59 degrees Fahrenheit. The GPS read 123 knots on the fastest leg, and in both directions the ASI showed a needle width over 110 knots. Many GA pilots are accustomed to figures like 75-percent power setting. 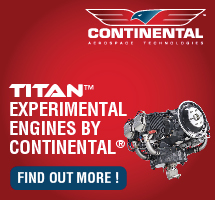 At that throttle position, they may save some engine wear and tear and gain better fuel economy, but in Rotax 912-powered aircraft, it is reasonable to fly at full power continuously. In fact, if you burn 100LL avgas, full power is better, say many experts. When using unleaded autogas that Rotax engines actually prefer (92 octane in the 100-hp 912S or 87 octane in the 80-hp 912), you can use a lower power setting as the engine doesn't have to burn off the lead. Eric routinely flies the Skylark with the throttle fully opened. The standard 24 gallons of fuel onboard should fly the Skylark beyond 500 miles, even holding some fuel in reserve. 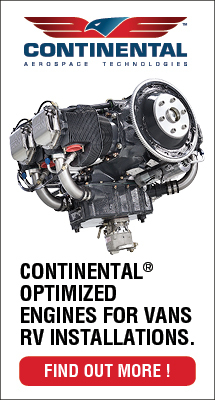 Fuel consumption rates are similar to other Rotax 912S-powered LSA. It appears designer David Marsden did his homework when assuring the Skylark was stable to fly. To verify this, I made my standard series of stability profile evaluations. Slow flight proved very satisfying with flight just above stall requiring only 3600 rpm (less than 50 percent power) with a full 40 degrees of flaps. The GPS showed 47 knots in a level flight, this number being perhaps 2 to 3 knots above stall. I sat in the right seat (an old flight instructor preference), and correcting for visual parallax, I estimate the ASI was showing a shade under 40 knots. But at these speeds I've found ASIs to have some error. In slow flight, the Skylark still showed plenty of control authority at 50 knots. As we neared stall (indicating about 45 knots), control forces got rather soft, as you'd expect. In all stalls-power on, power off, and accelerated in each direction- the left wing tended to drop. This was significant enough that in power-on stalls at 4000 rpm (about 50 percent power), I nearly exhausted the right stick range to offset the wing drop. In the interim this might be remedied by adjusting the fixed aileron tab on the right aileron. That tab is currently angled up, and it struck me perhaps that was too much angle and was overworking to lift the right wing. But Marsden and the Czech factory engineers are preparing a larger aileron at this writing, according to Josh. In my evaluation of longitudinal stability, I seek a trim position where the airplane holds altitude without pilot input. Then, in separate checks, I disturb the stick fore and aft by pushing or pulling gently and letting go of the stick. I found the Skylark positive in that the amplitude of up and down pitch motions did not grow, but neither did it slow to a stop when I let it go back and forth a few times. 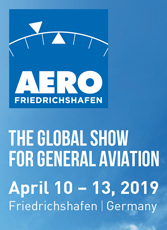 Perhaps that means it has the ideal amount of pitch stability, though most certificated aircraft will eventually come to level flight again. In another longitudinal stability test, I again assure a trim condition and then add or subtract power to see how the airplane responds without input. When I added power, Skylark's nose actually dipped down somewhat; when removing power, the nose raised. These are slightly counterproductive, but in both cases the result was very modest. For comparison, seaplanes with an engine mounted high will often exhibit an exaggerated response to power input. Some earlier Skylarks had a vibration at the joystick when flying at higher speeds. A service bulletin (the ASTM consensus standards equivalent of an airworthiness directive) was issued to address a gap seal that fixes those Skylarks showing this tendency (not all did), and aircraft in production now already have a different gap seat arrangement. A Skylark and You? Like many imported LSA, the Skylark's price has risen as the dollar sank compared to the euro. Currently, but subject to change, a 100-hp Skylark has a rather well-equipped base price of $114,900 before delivery charges. 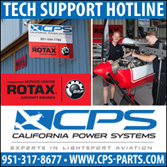 SportsPlanes.com has a variety of aircraft to provide lower costs if your budget requires. 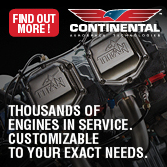 For example, the Comco- Ikarus C42 starts at $75,900 and the 100-hp made-in-the-USA American Flyer lists at $69,900, though it doesn't yet have special LSA (S-LSA) approval. For the Skylark's base price you get a basic panel plus the 100-hp Rotax 912S (often an additional charge of $3,500 on some LSA), plus strobe and landing lights and more. 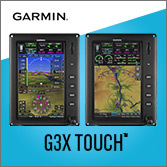 Owners who want to add radios, nav gear, and options like autopilots add to that price. At this range, the Skylark is in the upper range of LSA, though it has plenty of company. To help buyers personalize their Skylark, SportsPlanes.com's series of sample panels will soon give customers an idea of the appearance of a full glass panel or whatever other options they may desire. The advantage to buying from SportsPlanes.com is that you may find a representative in your geographical region. Each representative offers different services, but you have more resources than smaller organizations. To find a SportsPlanes.com center near you, visit www.SportsPlanes.com. After you compare Skylark's sharp design-many pilots love the modern winglet look-with other LSA and add up the relative values, you may join other American pilots who selected this machine from the evergrowing LSA fleet. Notes: 1 Averaged upwind and downwind flight evaluation at 4,000 MSL, per GPS. 2 See article for additional information about cruise power settings. 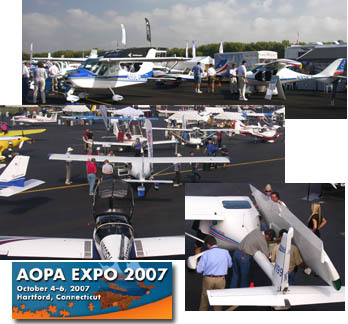 A Doubly International LSA SportsPlanes.com imports several light-sport aircraft (LSA) that have found ready buyers. After researching through several designs, SportsPlanes’ owner Josh Foss originally settled on the Comco Ikarus C42 and Breezer and the U.S.-built American Flyer for its fleet. Most recently, the company added the Czech-built Dova Skylark to its offerings. However, the real story of this company is not Josh Foss’ care in the selection of what airplanes to sell. What may be more important to the marketplace is the network his company has built to bring service and support to SportsPlanes.com’s customers. Currently, 15 SportsPlanes centers are operating, with the goal to establish 25 centers nationwide. Investigating the Skylark My opportunity to fly the Skylark came while attending the U.S. 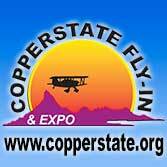 Sport Aviation Expo in Sebring, Florida, in January. 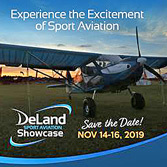 I flew with Darrell Hamilton, the SportsPlanes representative for Florida. Darrell retired from Northwest Airlines four years ago. He most recently crewed the fly-by-wire Airbus A320, which needs only small control movements. Many pilots are drawn to an airplane with winglets, but it may be the reflexed flaps that do more for Skylark's top speed (approximately 130 mph). 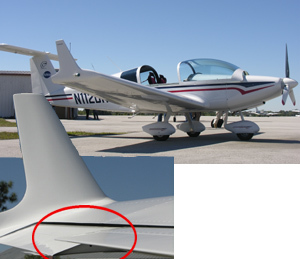 Inset photo shows neutral ailerons with the flaps positioned slightly above (circled). You can read my Skylark flight review in EAA Sport Pilot for May 2007. When you walk up to Skylark, you get an impression that usually lasts (a marketer's dream come true). While uncommon in light sport aviation winglets are well established on fast airplanes from bizjets to airliners. As a design feature, winglets that stick in your mind make the wingtip device a winner for sales reasons; any aerodynamic gain is icing on the cake. *** Burt Rutan is credited with first using the idea on his VariEze in 1975 and it was subsequently used by the Learjet 28 and the McDonnell Douglas MD-11. But the concept was invented even before the Wright Brothers first flight, way back in 1897. Even then they knew about wingtip vortices. 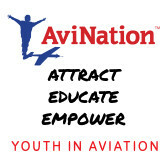 Get more winglet info. Skylark has become Sportsplanes.com's top-of-the-line LSA, flanked by the Breezer, C42, and American Flyer. Skylark was designed by Canadian David Marsden, who engaged Dova of Czech Republic to built it, later selling them the design rights. Skylark is an all-metal SLSA. When you walk up to Skylark, you get an impression that usually lasts (a marketer’s dream come true). While uncommon in light sport aviation winglets are well established on fast airplanes from bizjets to airliners. As a design feature, winglets that stick in your mind make the wingtip device a winner for sales reasons; any aerodynamic gain is icing on the cake. *** Burt Rutan is credited with first using the idea on his VariEze in 1975 and it was subsequently used by the Learjet 28 and the McDonnell Douglas MD-11. But the concept was invented even before the Wright Brothers first flight, way back in 1897. Even then they knew about wingtip vortices. Get more winglet info. Skylark has become Sportsplanes.com‘s top-of-the-line LSA, flanked by the Breezer, C42, and American Flyer. Skylark was designed by Canadian David Marsden, who engaged Dova of Czech Republic to built it, later selling them the design rights.